Today I am playing along Taheerah Atchia’s Advent Calendar Extravaganza. Here is what Taheerah has to say about her feature. Advent Calendar Extravaganza is -the- festive event of the season! This ‘hop with a twist’ was dreamed up by Taheerah Atchia and features surprise destinations each day! Joining in the fun with Taheerah are over 60 special guests – each serving up some fantastic Christmas inspiration! Just like an Advent Calendar, you’ll never know where you’re going to be visiting next until you ‘open the door’! Today I am sharing with you a Holiday card using Uniko products. I have used Stunning Snowflakes stamp set to create my background. This set has snowflakes images in three different sizes. Great for clustering. I have white heat embossed the snowflakes on watercolour paper. Then used Gansai Tambi watercolour to watercolour in layers. The heat embossed snowflakes resist the watercolour and pops out at you. Since the watercolour is in layers, I love the effect of colour pooling around the snowflakes. Once dry I spattered some Mr Huey opaque white. I set this aside to dry while I work on the sentiment. I stamped and white heat embossed the sentiment from All Occasion Sentiments #4 on a grey piece of cardstock. Then I trimmed then and cut fish tail on the right side of the strip. Once the watercoloured panel is dry, I used Simon Says Stamp Stitched Rectangle largest die to die cut a stitched edge panel. This panel is then adhered on a white card base using some craft foam. The sentiment is then adhered to the top left of the card front using foam adhesive. Finally I embellished with Pretty Pink Posh’s Sparkly Clear sequins. Hope you like my Holiday card today. As you have may have guessed, today’s sponsor is Uniko! It’s not a party without a prize – and with prizes every day there are several chances to win! Today’s prize is generously supplied by [sponsor’s name] so you’ll definitely want to get your hands on it! Simply leave a comment on this post to enter – then head back to taheerah-atchia.com and leave a comment there too to double your chances! Don’t forget to grab the other surprise destinations from Taheerah’s blog and head over to them to leave comments there as well to improve your odds even more! You have until 7am EST on Thursday 31st December to leave all your comments! Gayatri your snowy card is gorgeous! I have that set for a few more days … hope to make something as beautiful with it! Stunning Gayatri! Blue is my fave one and your watercolor BG is too gorgeous! Love it! A gorgeous snow-flake flurries sky here, Gayatri! You've card makes me want to bundle up and go for a stroll, to catch the snowflakes on my mittens! Thank you so much for being part of Taheerah's Advent series! Wow! Love this beautiful royal blue background! Beautiful background ! I enjoy my Gansai Tambi watercolors and they look so vibrant on your card. Beautiful vibrant blue in your background! Love this bold, bright card! Oh my goodness! That is so striking! Love the deep rich color! Like the heat embossed snowflakes. gorgeous card… love the snowy background! Gorgeous colored background and pretty snowflakes! Lovely card! Great card. Love your bold blue background. Gorgeous blue background & love how the sentiment pops! The background is so bright and vivid. it really makes the snowflakes pop off the card. Your snowflake card is stunning! My sweet husband is buying me those watercolour paints for Christmas, so I shall be able to try something similar next year! Exactly my favorite style of card…..wonderful background with simple sentiment. LOVE that deep blue for your snowy sky!!! Just gorgeous. Wow this rocks! Love the beautiful background of your card!!!! Beautiful card Gayatri!! Very beautiful color combination. Quite stunning! Love the gorgeous background color. As always, Gayatri, this card is stunning! Beautiful card! I love all the detail with the embossing, watercolor and sequins. Thanks so much for sharing! What a stunning use of blue! I love it! The many shades of blue are so heavenly… what a most stunning card! So bold and bright. Love this card!!! What a gorgeous and beautifully vibrant card you created. It's just lovely! Love the richness of the blue. That snowflake background is fabulous. This snowflake stamp is so dramatic embossed as you did against that stunning background. What a knock-out card! Fantastic card Gayatri. 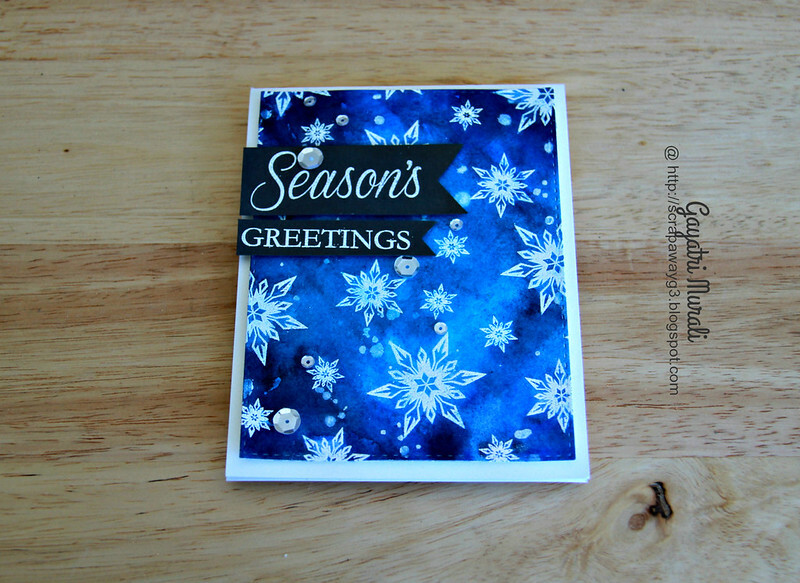 Love the striking blue hues with the heat embossed snowflakes. Your snowflakes really are STUNNING against your MAGICAL background – LOVE IT!!! Love the bright colors in your snowflake card. Thanks for sharing. Love the eye catching color and the pretty snowflakes. I LOVE the water-colored background on this beautiful card. So gorgeous! Thank you for the inspiration. Absolutely gorgeous card Gayatri! Amazing color vibrancy and so wonderfully balanced. Your card is gorgeous! Thanks! Beautiful! I love the vivid blue! Beautiful background — thanks for the inspiration! WOW! Those snowflakes are gorgeous! And your varied blue background is magnificent. Nice job! Oh. My. Gosh!!! This is incredible gayatri!!! I love the watercoloured panel…it is stunning! oh my word!!! WHat a striking card. LOVE that background. WOW!!! Very stunning and very beautiful!! i love the blue!! This is beautiful Gayatri. This is the reason I am trying to learn watercolouring. Every time I see cards like this I am even more determined to learn. Just beautiful! I love these vibrant colors and it just makes those snowflakes jump right out. Beautiful! So wintery and festive!!! 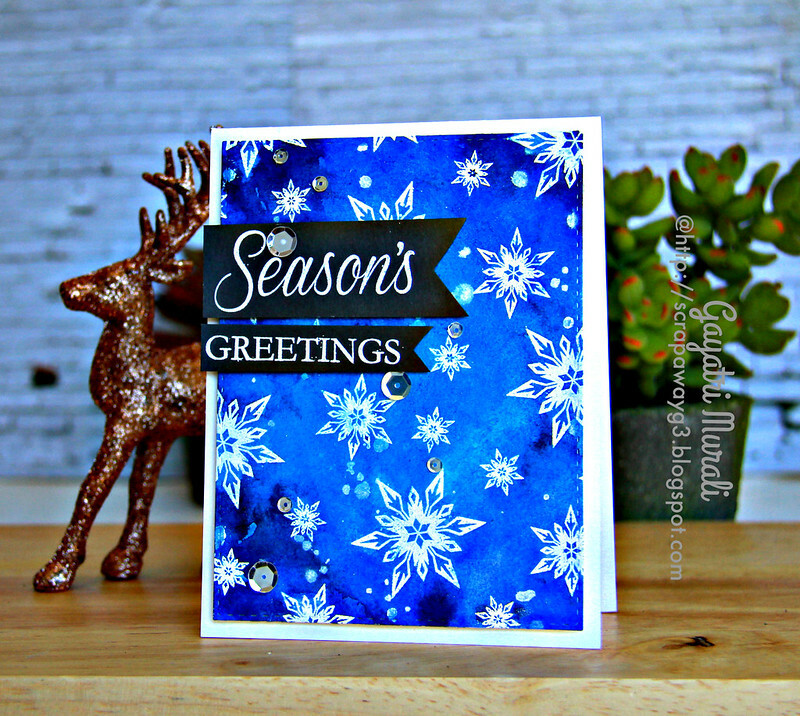 Your watercolored background is perfect for your white embossed snowflakes. Wouldn't have thought to ink sentiment on gray but it looks awesome, Gayatri! That's such a beautiful blue background! Gorgeous! Wow, what a gorgeous blue to highlight the snowflakes! Such a stunning blue background to highlight the snowflakes. Gorgeous! That is simply stunning… so vibrant and I love the colour you chose. Thanks for sharing. Cheers. What a striking blue background for those lovely snowflakes Gayatri. The background on this is AMAZING, Gayatri, gorgeous card!!! That background is so vibrant, its almost iridescent. The Stunning Snowflake stamp is a very pretty snowflake and almost star-like! WOW stunning and bright card! Love it! Oh Gorgeous!! Love the watercolor background!! Love your background and it lets the snowflakes stand out. Amazing background — and such a vibrant blue! Gorgeous card!! What a beautiful stamp set and I love that you heat embossed and used watercolor! This hop is so much fun, I am enjoying getting to know new (to me) bloggers and seeing all sorts of projects, cards, etc… It is truly inspiring and I am having a blast clicking on that little door each day and seeing who is behind it. Thanks so much for participating and for the beautiful card you made! Stunning! Love the color of the background! Your card is gorgeous. I love the color combination. Now I'm a new blog follower. Oh I love this card. I love blue. Thanks for sharing. As always, gorgeous! The snowflakes really pop! Oh I love your card – so vibrant and sparkly. WOW gorgeous luxe color! Love this card! Such a beautifully vibrant background. Your card is stunning! Really like the intensity of the color! Beautiful. This is SUCH a gorgeous background!!! Gorgeous card, beautiful water colored background for these pretty snowflakes! Love the layers of watercoloring. Well, here I was thinking ….”that is just STUNNING” and then I saw the name of this stamp set….”Stunning Snowflakes” LOL….guess I got that one right on the nose! Stunning snowflake card! Love the blue! Wow! This is beautiful! That blue is amazing!!! So pretty. LOVE that wonderful color blue! Certainly highlights the white snowflakes! Thanks for sharing! Love your beautiful background. Thanks for sharing your terrific card. How beautiful! That background is breathtaking!!! What a beautiful bright and happy card – gorgeous! Thanks so much! wow that is one gorgeous background! Love the blue in this card. Striking card, such a beautiful deep blue background! This card is very striking because of that deep blue. Gorgeous card Gayatri! Love the background! TFS! Love the snowflakes you used, and the blue is so vibrant! The rich and luxurious blues are magnificent!!! LOVE this card to pieces!! TFS! Merry Christmas! This card is beautiful! I love the intensity of the background! Thanks so much for some beautiful inspiration. Love the contrast between the bright white and dark blues..
Love the sentiment on the black tag against that striking blue snowflake background!! So stunning! l love the bold and vibrant background you created! Wow! an absolutely gorgeous card!! Love those snowflakes. Stunning card! I love the vivid background colors. The snowflake images are beautiful. TFS. Just stunning! Love that intense color! Wow, your background is just gorgeous! What a beautiful card! Gorgeous! Your card is amazing! Using the watercolor was really beautiful! Nicely done. Such beautiful, rich colour! Gorgeous! This is a beautiful card! 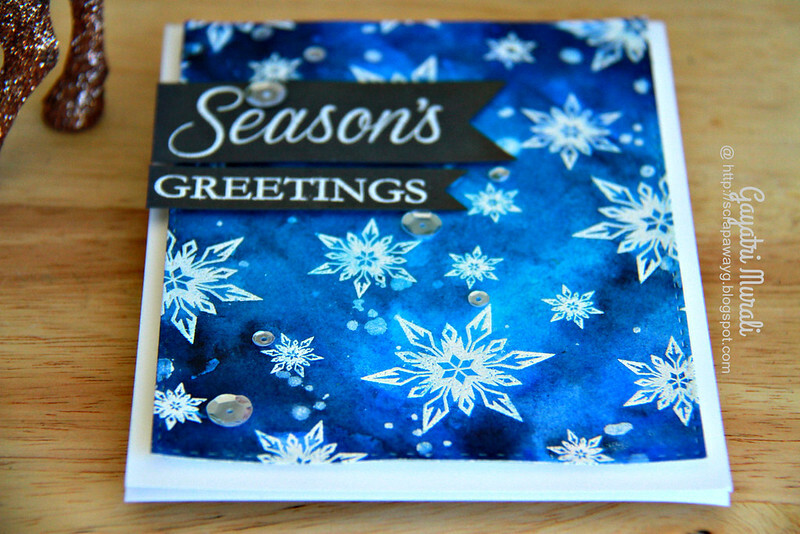 The blue watercolored background with the crisp white snowflakes is gorgeous! The blue is AWESOME and such a change of pace! Wow! What a stunning card! Love the combo of intense blue and pure white. Gorgeous depth of color! Well done! I love this background & colors! It's so striking, thanks for sharing!